There are two distinct ways to look at news that production on the latest James Bond film has been delayed for a "script polish." Reaction No. 1: No big thing…scripts get polished all the time. Reaction No. 2: This thing is a giant turd…everybody panic! It's difficult to know which reaction is correct following Friday's Daily Mail report (re-reported by Crave film site Coming Soon) that veteran Bond writers Neal Purvis and Robert Wade (Casino Royale, Quantum of Solace, Skyfall) have been hired to "punch up" John Logan's completed script for the currently untitled Bond 24. According to the Mail, the marching orders for Purvis and Wade are to "sprinkle in more gags, emphasising the witty repartee between Daniel Craig’s 007 and Naomie Harris’s Miss Moneypenny, and focusing on the interplay between Bond and Ralph Fiennes’s M."
Could this be an indication that producers Barbara Broccoli and Michael G. Wilson are ready to course-correct the franchise from the uber-serious, humor-free vibe of the Daniel Craig Bond features back in favor of the time-honored breezier, cheeky past feel of the Connery-Moore Bond days? Oh yeah…the Mail also reports this polish is necessary enough to require delaying the start of the production two months — from October to December. 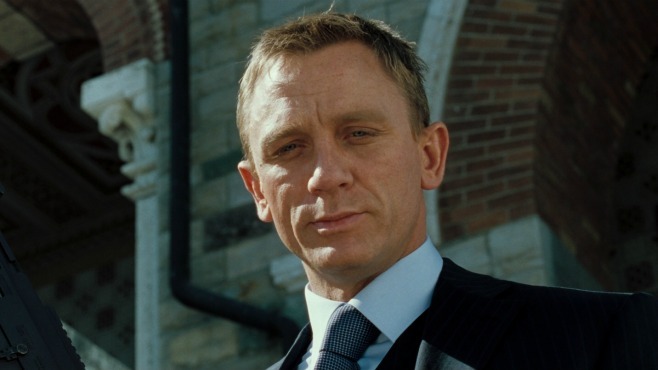 We'll find out what it all means when the Sam Mendes-directed Bond 24 hits theaters November 6, 2015.